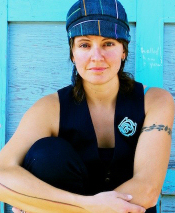 Tanya Davis is a poet, storyteller, musician, and singer-songwriter who fuses these elements together in a refreshing matrimony of language and sound, side-stepping genre and captivating audiences in the process. 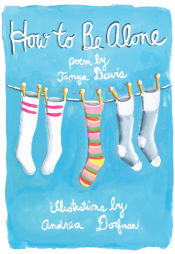 Tanya was the 2011/12 Poet Laureate of Halifax, Nova Scotia. She regularly receives commissions to pen poems and speeches and has worked in this regard for such bodies as the Canada Winter Games, the PEI Advisory Council on the Status of Women, CBC Radio, and the National Film Board of Canada. She also works and performs as a songwriter and musician and has released 3 full length albums, picking up awards and nominations for each one. She has performed at festivals as well as in schools across Canada, and appears frequently on radio and television. Her first book of poetry, At first, lonely, was published in 2011 by Acorn Press. She is currently at work developing a full-length, multi-disciplinary show, funded by the Canada Council for the Arts. 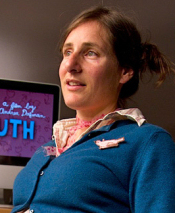 Andrea Dorfman is a filmmaker, animator, cinematographer, and artist. She is a graduate of McGill University and the Nova Scotia College of Art and Design. Since 1995, she’s made numerous experimental and dramatic short films, two feature films – Parsley Days (2000) and Love That Boy (2003) – and the documentary, Sluts (2005). For the past few years she’s been working in animation at the National Film Board of Canada creating the Emmy-nominated Flawed (2010) and Big Mouth (2012), as well as creating mini-documentaries for the charitable human rights organization The Equality Effect. Currently she is developing her third feature film and working on an interactive documentary with the NFB on Fogo Island, Newfoundland.She lives inHalifax, Nova Scotia, with her partner Dave and (half the time) his kids, Max and Sydney. She occasionally teaches film and video classes at the Nova Scotia College of Art and Design. 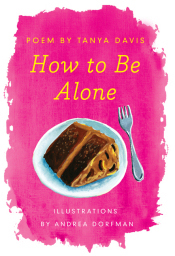 In 2009, poet and songwriter Tanya Davis collaborated with independent filmmaker Andrea Dorfman to produce a short video-poem entitled How to Be Alone. The short has since been featured at numerous film festivals, including The Vancouver Film Fest, The Worldwide Short Film Festival, and the VideoPoetry Festival in Berlin. The video has earned more than 5 million views and seen worldwide circulation on popular social networking platforms like YouTube, Vimeo, Tumblr, and Pinterest. How to Be Alone is a book about being okay with being alone. It’s an inspirational how-to guide to embracing solitude rather than fearing it. From the bathroom to the coffee shop, the lunch counter to the movie theater, How to Be Alone emphasizes that being alone doesn’t mean being lonely. It is a poetic tutorial on how to find happiness and freedom in solitude and how to thrive in a world that makes you feel bad if you’re alone.